We love loud cars that make strange noises even though they are harmful to our ears. There is just something about them that excites our senses as motorheads. The flutter of a turbo, the whine of a supercharger or the grumbling of a straight pie exhaust can always turn heads. Since these sounds are so desirable, car enthusiasts spend loads of money on acquiring turbos and superchargers. However, the majority of us do not have that kind of money so we look for a quick fix. In comes the straight pipe exhaust system, which is the easiest way to make your car sound louder. In essence, a straight pipe exhaust is an exhaust system that involves joining a pipe directly from the exhaust headers and taking it straight to the end tip without the involvement of a catalytic converter or a muffler at any point. Straight pipe exhausts are loud. Really loud. Which is why they are usually found in racing engines and performance vehicles. These exhaust systems let exhaust gases flow freely from the engine allowing them to go in the atmosphere directly through the exhaust tip. What’s not to like? Let’s take a look at what makes straight pipes wonderful. 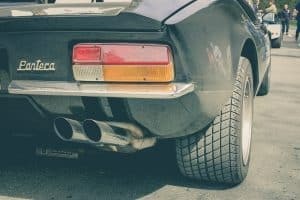 The biggest reason that many people opt for a straight pipe exhaust is that these systems enhance your car’s horsepower. These systems reduce back pressure from the engine which allows exhaust gases to flow freely and help the engine perform without hindrances. You get better fuel economy and slightly better horsepower. However, the size of the pipe is important. You can’t just go and get a thick pipe for your car. You need to get a proper analysis by a certified mechanic to get the best output for your car. Straight pipes also make your car stand out in the crowd. You can apply a chrome finish to the exhaust tip to make it look appealing. Various types of welding methods are used to give beautiful colors to the tip. You can find green, blue and red colored patterns on the tip that make it look highly appealing. Furthermore, you can go for a twin pipe setup for an even better aesthetic. In the racing world the more exhaust pipes you have the sportier your car is. That is why many modern sports cars come with quad exhausts instead of twin exhausts. The straight pipe exhaust system lets out the true sound of an engine. Since there are no restrictions in the way like a muffler, the car sounds raw and pure. However, you might have to rethink starting your car early in the morning as that would definitely wake your neighbors. If you really love the sound of straight pipes – We can recommend the Kooks exhaust pipes on Amazon. Click here to check it out, don’t forget to search for your car model. Just like everything else in the world, a straight pipe exhaust system has its advantages and disadvantages. It is up to us to decide what to sacrifice and what to gain. Straight piping is expensive. First off, you need to change the entire exhaust structure to make way for the new pipes. New pipes are not cheap and are hard to come by which is why there is a trend for custom built exhaust pipes. Furthermore, after you opt for a straight pipe exhaust system, you have to tune your vehicle according to certain standards. Tuning is not cheap as well, so make sure you have deep pockets before you decide to make the conversion. Yes, straight pipes make the best sound but they are not great for the environment. In the late 20th century catalytic converters were introduced to vehicles to counter the effects of pollution caused by cars. However, initial catalytic converters were not very viable for performance vehicles. They restricted the flow of gas and did not allow the engine to breathe freely. The catalytic technology advanced over the years and now modern cars have high-flow catalytic converters that allow a large percentage of the gas to run freely. But still, they are not as good as a straight pipe system. That can’t be helped as cat-converters are required by law. If you still go for a straight pipe system keep in mind that you won’t pass the emissions test and your car won’t be allowed on the road. To get the best of both worlds, you could go for a cat-back exhaust system, which is essentially a system that has a cat-converter and a straight pipe setup. Perhaps the only reason motorheads go for a straight pipe setup is that they want their car to sound loud. What they don’t realize is that straight pipes can make their car extremely loud to the extent that starting and driving one in a suburban neighborhood could warrant police attention. Enthusiasts that go for such systems usually only drive their cars on race tracks. So, if you are lucky enough to have a race-track in your city a straight pipe setup would be a great inclusion for your vehicle as you will be able to test it to its limits. 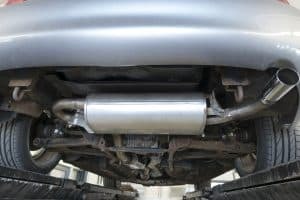 After weighing the pros and cons of a straight pipe exhaust system it should be clear that if you are going for one in your car, you should be ready to face some consequences. It is hard for you to get a performance car that runs fast, sounds good and is street legal. The term street legal has become increasingly relevant nowadays as more restrictions have come in place against streetcars and their act of polluting the roads and the environment with noise and air pollution. However, modern problems have modern solutions. Manufacturers have created a by-pass solution for car enthusiasts. The by-pass system allows you to switch between two exhaust setups. With the push of a button, you can open up a valve that takes the exhaust gas to a straight pipe exhaust tip. When you are in the city, you can press the button again and channel the exhaust gases to a muffler, saving you from judgmental stares.